Having had an oblique issue for the last few weeks, it’s been hard to get out to run. While an ideal running form features primarily a horizontal orientation where the energy pushes the runner to limit the up-and-down vertical movements of running, few runners can actually run like former NYC Marathon champion Alberto Salazar who epitomized a still upper body and a glide-like running style. I have a little bit of vertical movement in my running style, but it’s still there and what little I do move up and down affected my oblique such that I focused instead on cycling the last few weeks. As such, my run miles were few and I worried a lot about how I’d fare in a half-marathon or any running competition. 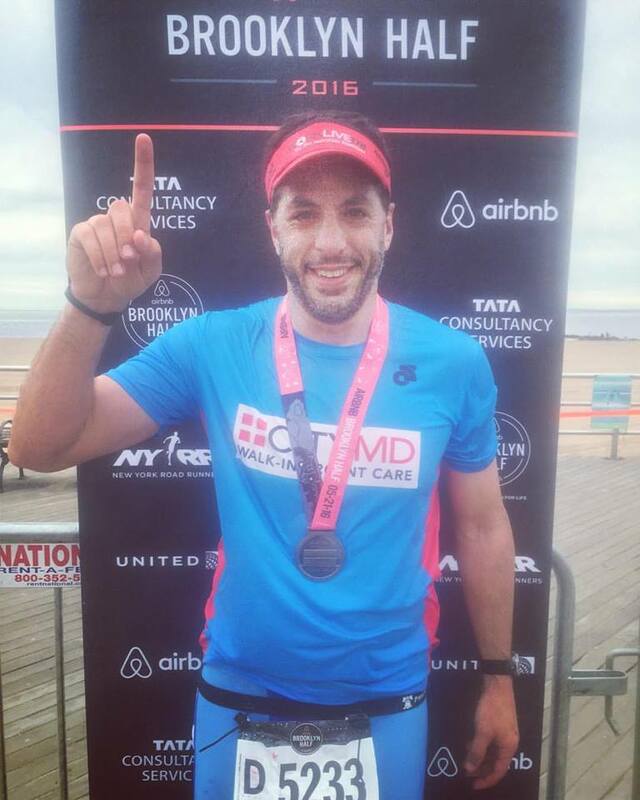 For the Brooklyn Half, an event I’ve done 3 or 4 times, I had low expectations. I would have loved seeing something sub 1:50, but figured I’d be closer to 1:55. My last half-marathon in March at the NYC Half brought me in at 1:55 and change, and before that at the Staten Island Half, I came in a few seconds shy of 1:49. My best buddy Fernando and I have done a lot of races together and in all but a few of them, he’s been faster than me. It’s not so much a competition between us as we are so supportive of one another, but in this event, neither of us believed that we’d have a banner day and there was the potential that we’d run together for most of all of it. It was an early start time; 7 a.m. To get there in plenty of time to take care of the bathroom break, checking our bag, and getting situated in the right corral, we had to get up at an unGodly hour and take the subway. For me, that meant a 3:45 wakeup and meeting at the subway at 5:15. We got to the race at 6 a.m., took care of the essentials, and got ready in the corral for the big day. We were light-hearted and in great spirits, except Fernando was struggling with stomach ailments likely from some bad sushi the day before. We both hoped that he’d fight through it like he has before. I was decked out in my CityMD running kit and felt great representing my partner. Once the start gun went off, it took us nearly 20 minutes to get to the actual start line. This was said to be the largest half marathon in the US with something like 27,000 runners. It was crowded, but well-managed. The first mile was nearly all downhill, so I took off and Fernando told me later that he was within sight of me. I had expected to positive split throughout the race; that is, while most would say it is better to have a faster latter half of the race and to race conservatively in the earlier part to achieve it, I knew I’d have a very tough time in the final miles and therefore decided to take advantage of feeling good early and go for some time advantages early. By the 5k mark, I was averaging just under 8 minutes per mile. That’s fast but not so fast that I believed that I’d blow up at the end. Who knows, I thought; maybe my body would cooperate and I’d be able to sustain the pace or something close to it. By the 10k mark, I saw some slowdown in the pace, but chalked it up to the hills in Prospect Park. I still felt pretty good and seeing my oldest friend Jeff and his wife and son also buoyed my spirit. At or near mile 7, we entered onto Ocean Parkway and to a straightaway that would be boring and flat for about 6 miles. I thought I’d get myself into a zone and really sustain the pace, or even experiment with pace when I felt it to be appropriate. For the most part, that happened… until mile 9. I noticed my mile splits were getting slower and that effort to maintain the pace, albeit slower, were much harder. This was not a good formula. It would be one thing if I put out a stronger effort and had times to reflect that effort, but to try harder and be slower sent a message; I was in trouble. Miles 9-12 were hard, and I had to really fight the urge that said slow down or even stop. A big motivator was thinking that I was still beating Fernando. I hadn’t seen him pass me, but I sensed that he was close. With each runner who passed me, I breathed a sigh of relief even though I wasn’t supposed to actually racing him! Of greatest concern to me was a hot spot in the center of my left foot. It was a blister that was being created and growing in pain. I had to alter my foot plant and I’m positive that that slowed me down, possibly to the tune of 30 seconds per mile or more. After the 12 mile mark, I felt confident that I’d finish under 1:50, and be close to 1:49, but I had no ability to “kick” in the final mile to get a fast finish; the foot discomfort was really strong. So, I sauntered into the finish line with a finish time of 1:49:19, just 23 seconds or so slower than the Staten Island Half back in October. I was pleased and not at all disappointed with the lack of end-race strength. Had the blister/foot issue not been there, I’m sure I would have come in around 1:47. A few moments after crossing, I saw my phone light up with a text message from Fernando. Turns out that his stomach issues were bad and that he was at mile 10 walking. When I eventually saw him 40+ minutes later, he was pale and in a very bad way. Beginning after mile 4, he had intermittent stops in the porto-john to address what he described as a gas bubble in his mid-section. He tried forcing himself to vomit, he tried resolving things through the other end, and nothing worked. He stopped by a medical tent but they had nothing for acid reflux or whatever it was that was keeping him sick. The fact that he was able to finish is amazing; it would have been far easier to quit, get a ride to the finish line, and deal with that disappointment. Instead, he alternated walking and running and got it done. I’m very impressed. It was my 20th half-marathon. It was not my fastest by any stretch, and I was under-trained for it. No matter though; my spirits were through the roof. I smiled in those moments between miles 9 and 12 even though my foot discomfort was so prominent. I kept thinking good thoughts and doing math to figure out when I’d finish. I knew that I’d be putting on my post-race CityMD polo shirt and that the feeling of being dry and warm was VERY enticing! I also dreamt about the post-race beers at the Coney Island Cyclones baseball stadium (which never happened; when I saw Fernando and we assessed his condition, we b-lined it to an Uber car to get him home). I kept saying thank you… for being able to do this stuff. After the 50 mile bike race six days prior, and some decent cycling miles mid-week, this felt like a big race to me. Today, the day after, I rode another 45 miles with my friend Sarah and felt a little fatigued but generally great. I love that I get to do this stuff. A fuzzy pic, but I’m happy as a clam finishing yet another Brooklyn Half Marathon! Go CityMD! Follow comments by subscribing to the Brooklyn Half Marathon Comments RSS feed.